Snake charmers, monkey handlers, tortoises, teeth pullers, henna tattooists – and that’s just the main square Djamaa El Fna. 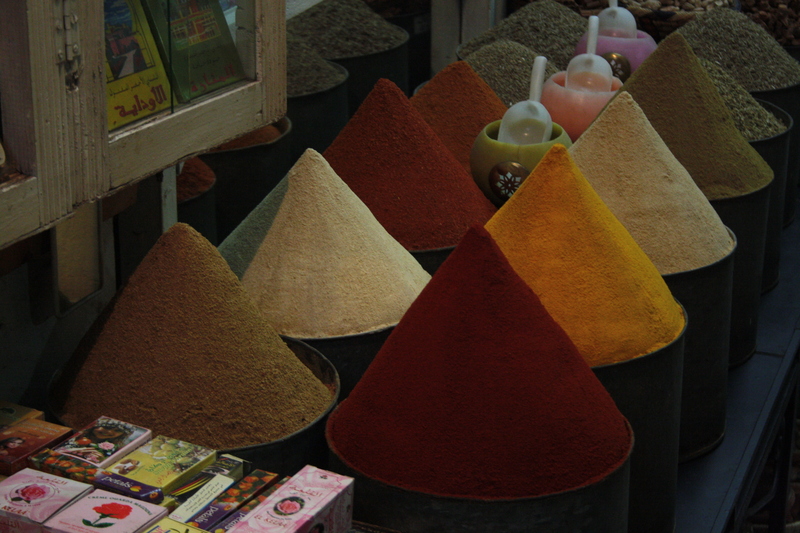 I’ve always wanted to explore the souks of Marrakesh and enjoy the vibrancy of the city. It definitely didn’t disappoint, behind the old walls the city is crazy! The city is definitely more food than drink. Alcohol in Marrakesh is tough to come by. My nose managed to sniff out La Boheme, a beautiful restaurant that overlooks the main square and has brilliant waiters. 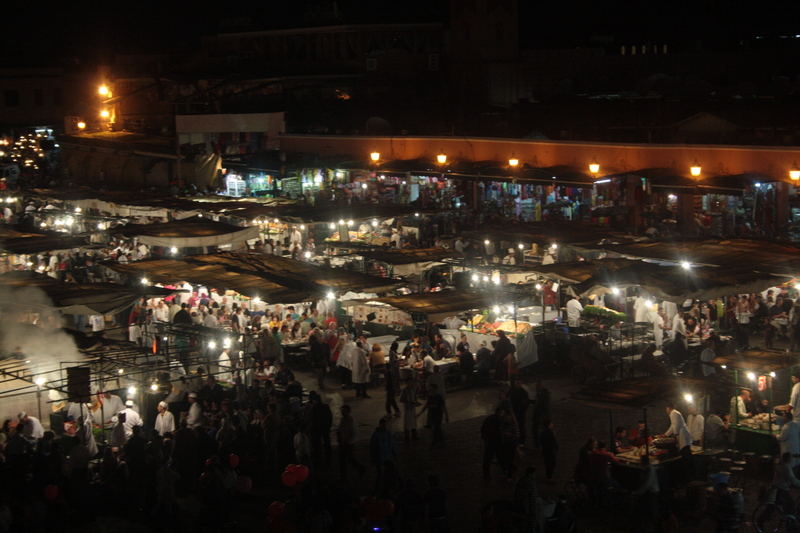 As for food, the only place to go for dinner is the Djamaa El Fna. In what seemed like the blink of an eye from our position at La Boheme, the vendors had set up over 200 food stalls selling a range of small plates from calamari to tajines to meat skewers. The boy sat next to me had a whole ram’s head slapped in front of him. We got a good feast for two for less than 200dh. For dessert move to the spicy ginger hot cake stalls, or you could try the many snails stalls for a little after-dinner refreshment. Lunch was a chicken kebab from a street vendor with a coke, 40dh. All washed down with a freshly-squeezed and locally-sourced orange juice for just 10 dh from the many vendors in Darm el fejaaa. 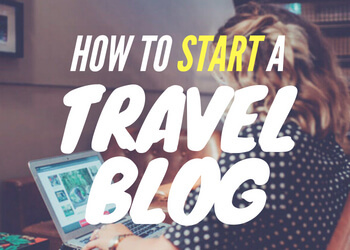 Check out my friend Dannielle’s post on how to spend 4 days in Marrakesh, for more tips for your itinerary. The Museum of Arts (30dh) had some lovely traditional Moroccan costumes and artefacts but my favourite part was the roof garden where you could see over the whole of Marrakesh in quiet comfort. From the main square you’re sure to get a local to persuade you to follow them to the Dyer’s Market where you’ll see how they dye all the fabrics and they’ll try and persuade you to make a purchase. We bought a joint ticket which got us into the Medersa Ben Youssef, the ruined ancient mosque and the Morocco Museum. We saw beautiful mosaic, artwork and tapestries and the building was amazing. Go beyond the city walls through the Jardin Marjorelle. You’ll find massive hotels, beautiful houses and some lovely restaurants. It’s a welcome break from the craziness of the city and you can also enjoy a huge banana split, like I did. While you’re in Morocco you must visit one of the hammams. Marrakesh has them in every street, and while I was apprehensive about the full hammam experience – being rubbed down with a rough scrubber and black soap by someone – I did have a wonderful massage using Algan oil for 300dh. I went May 2-6 (4 days). It rained on the first day but quickly brightened up. It was a bit chilly at night and some of teh building smelt of the wet wood, but I’m sure this is because they’re not used to the rain. The rest of the time it was hot and sunny. From Marrakesh’s bus station it was 40dh to Hostel Riad Marrakech Rouge. On getting out of the taxi we didn’t have time to think before a local boy said he’d show us the way. It was only a 3-minute walk from the taxi rank but the boy demanded 100dh for showing us the way. Then two of his friends appeared. Apparently this is normal so be warned! It was a great hostel with tea on arrival. We had a double en-suite private which actually had 5 beds in it. The hostel owners were really kind and took the time to chat to us while we were up on the incredible roof terrace. Because of this terrace it was a really sociable hostel with great views across the city. We had a tasty free breakfast and you could order shish. 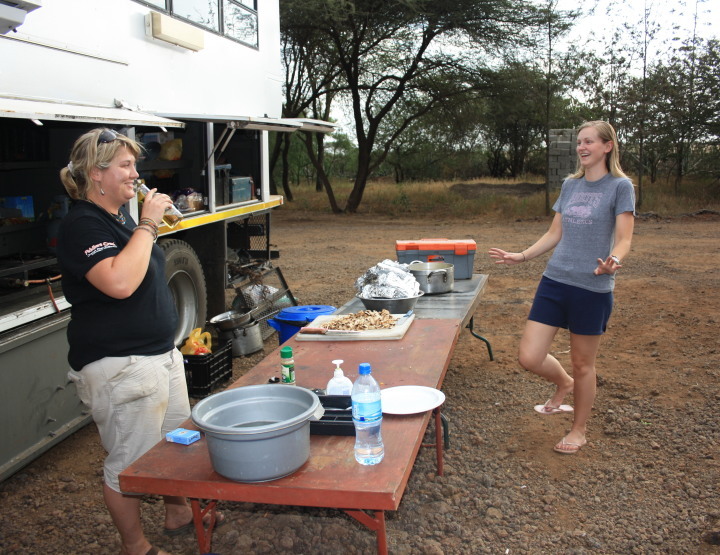 We paid 1080dh for 4 nights. Looking for an exciting, hot, city holiday with family and friends. 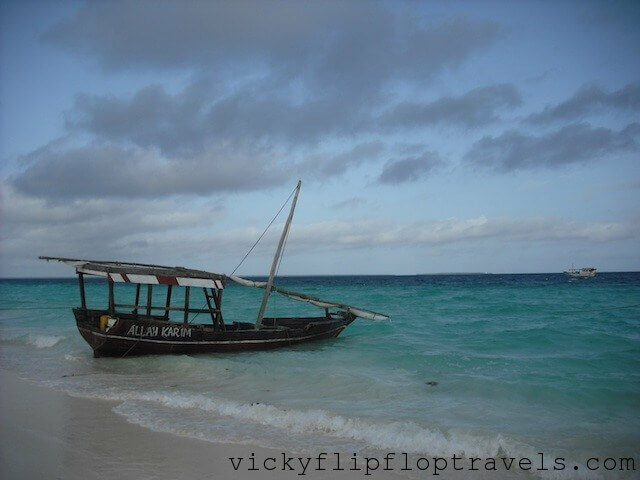 cheap family beach holiday or a romantic escape. 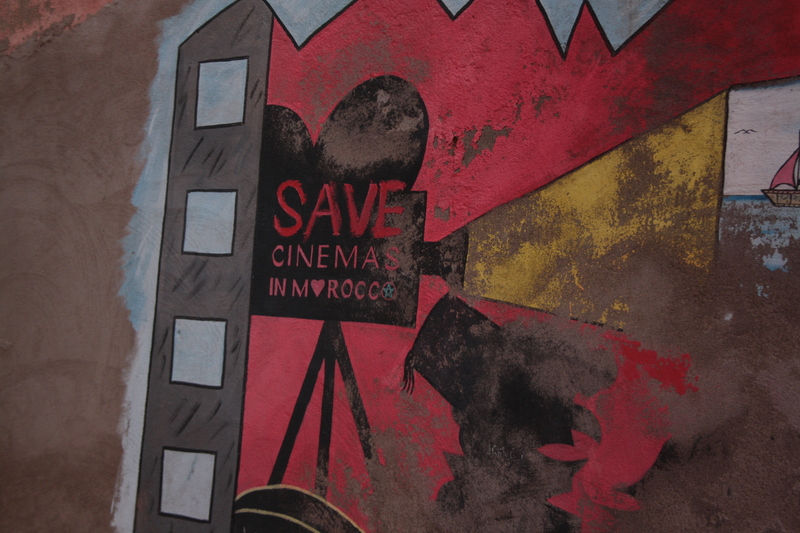 Walking around Marrakesh we found an old cinema with brilliant retro film posters outside. We stood admiring it and then a guy invited us in to look around. 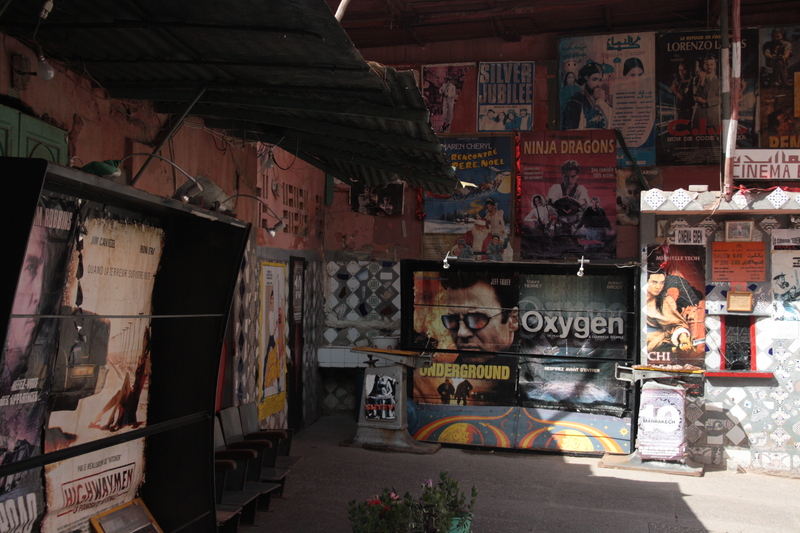 The forecourt was filled with amazing movie posters from many years ago, it had been just 40dh to visit before the place had stopped showing films because of the big out-of-town cinema just outside Marrakesh. It’s such a shame places like this shut down, but that’s just commercialism isn’t it. Why would you go and watch a film in uncomfortable seats with bad sound when you could go to the multiplex down the road. The guy there told us he was trying to keep it open as a museum, so we gave him a few dirhams towards it. 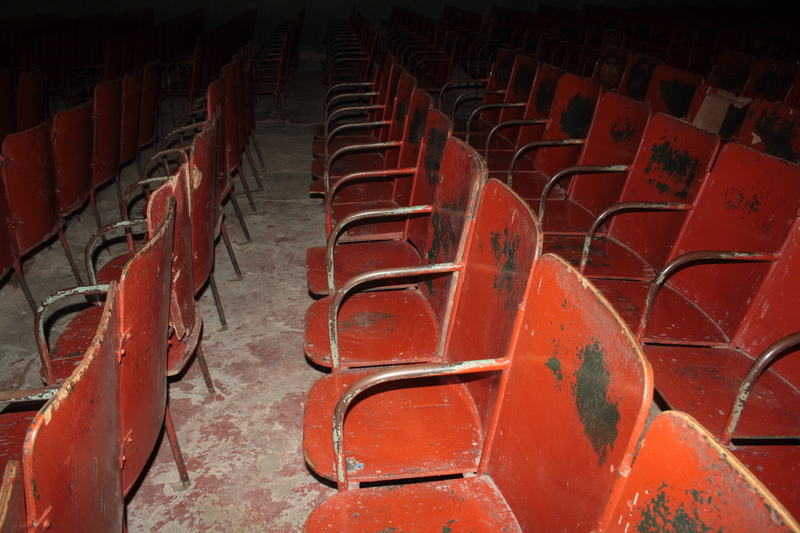 There had been a campaign to Save Cinemas in Morocco, but it hadn’t worked. Inside there were two tiers of seats facing the screen. It was lovely and cool in there away from the African sun, but those seats did not look comfortable. Wouldn’t fancy a three-hour epic sat in those chairs, even if it is only 40dh. 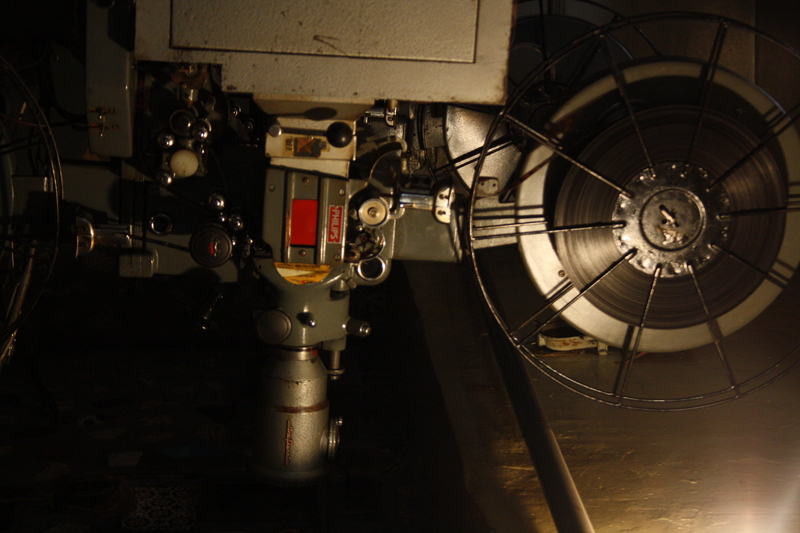 We managed to get in the projection room at the back. It was up some winding stairs and the room was amazing. 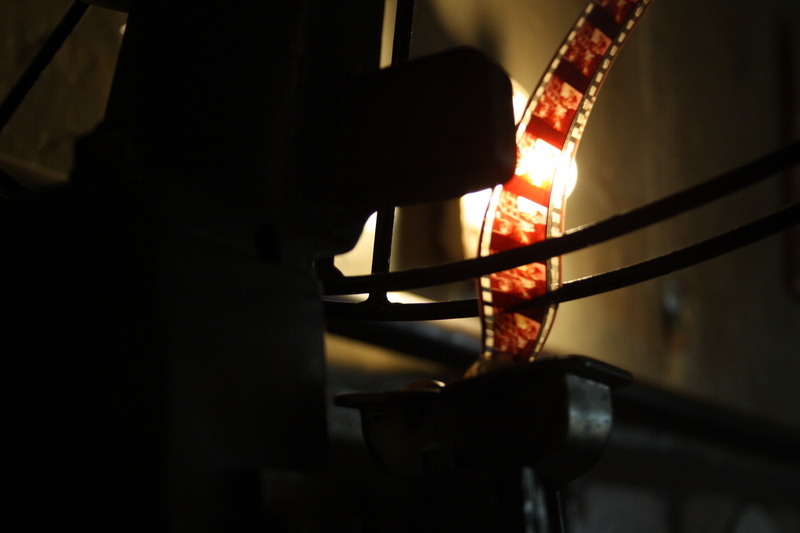 It was all still in place with the reels of film half in the projector. 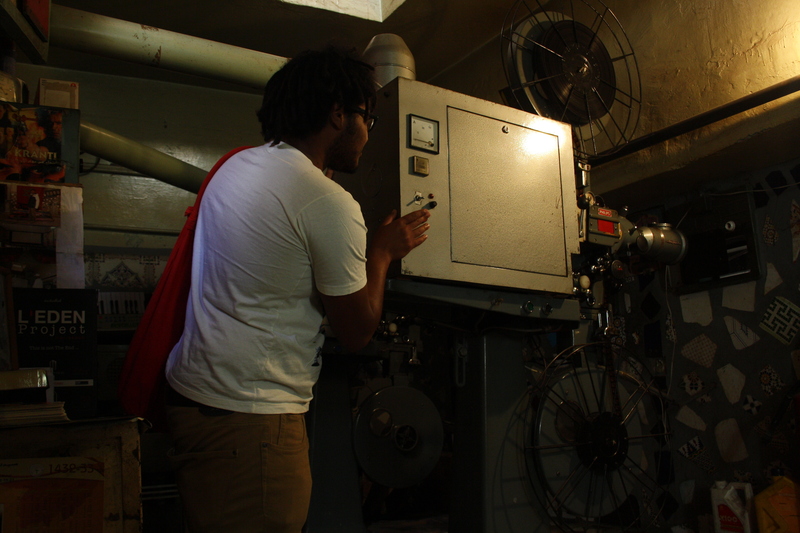 Waiel is a film buff and was pretty much wetting himself with excitement. 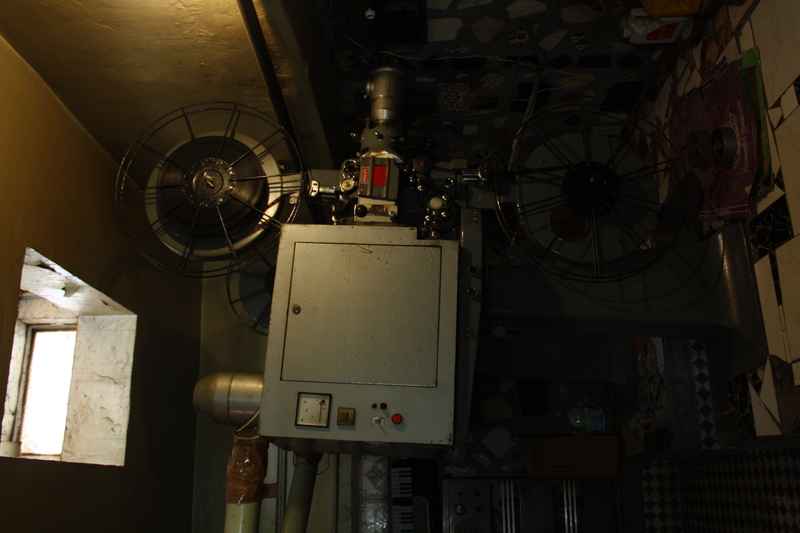 The room looked like it came from the ‘Golden Age of Cinema’. 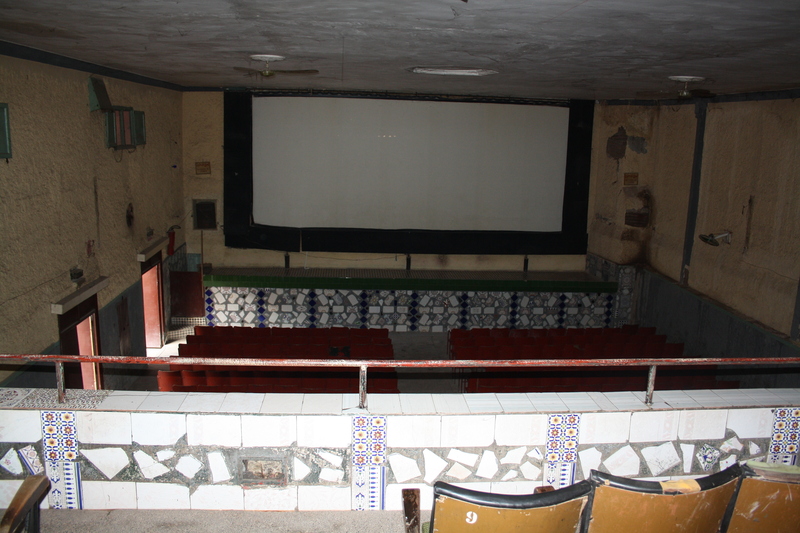 It was cool to see how cinemas used to be and to see somewhere other people might’ve missed in Marrakesh. It was also a great way to get out the heat and craziness of the Jamaa el Fna. 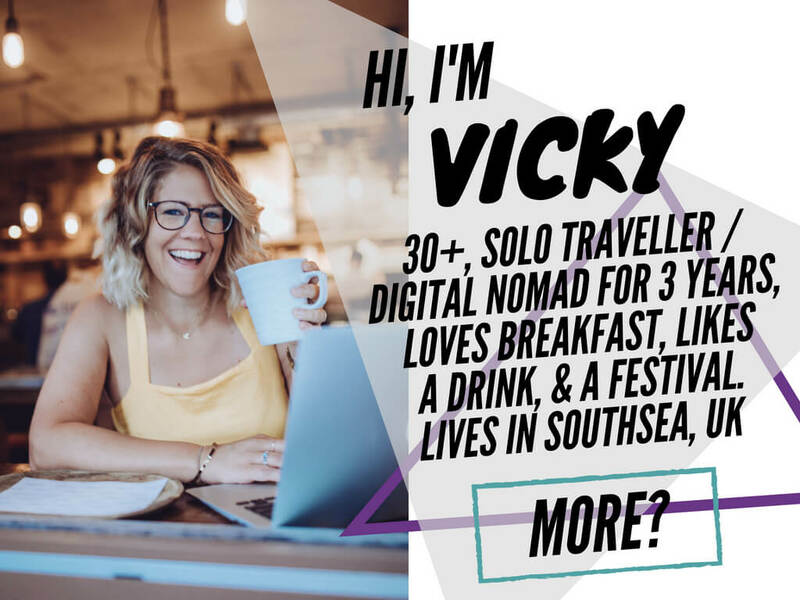 Looking for a boozy holiday and hate people hassling you! Beggars and men will try to sell you stuff all the time. As you walk the promenade they will try to sell you excursions, jewellery and anything else they can get their hands on. Learn to say no! 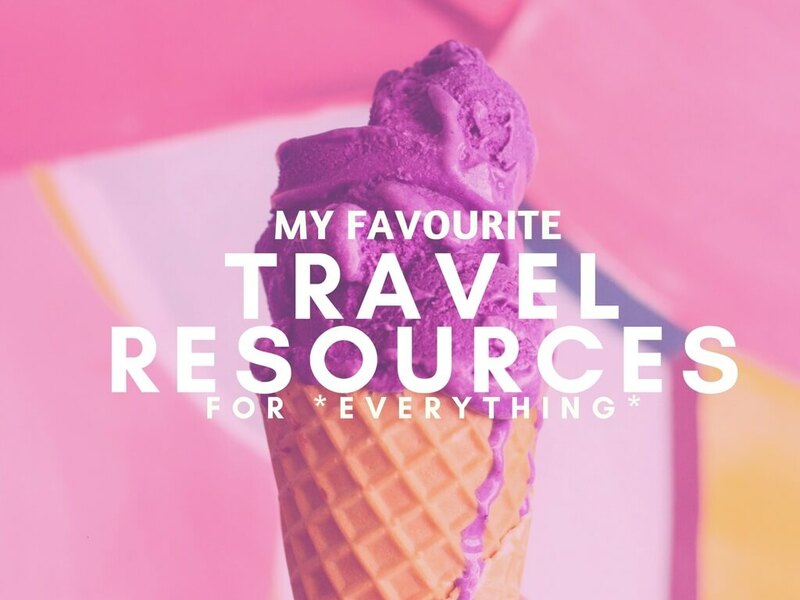 I recently posted about Marrakech too! It's a great place to go on a little break from the UK. I went in November and it was really warm. 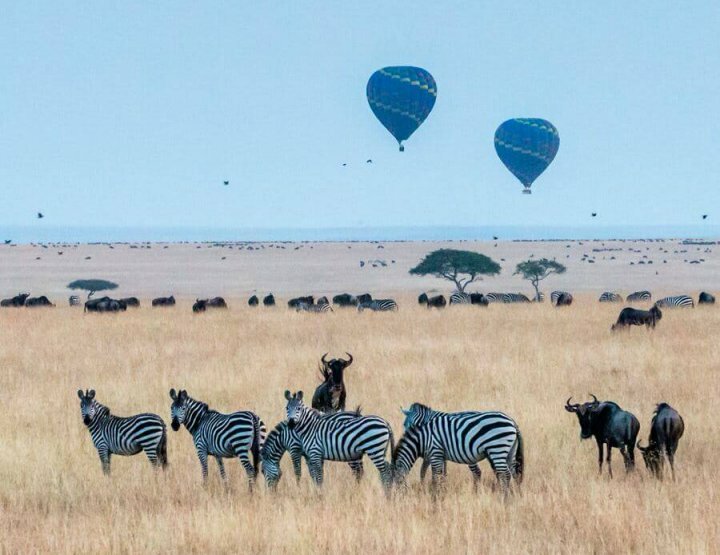 The flights were incredibly cheap too. I'd recommend it at that time of year because you can get all your Christmas shopping done. 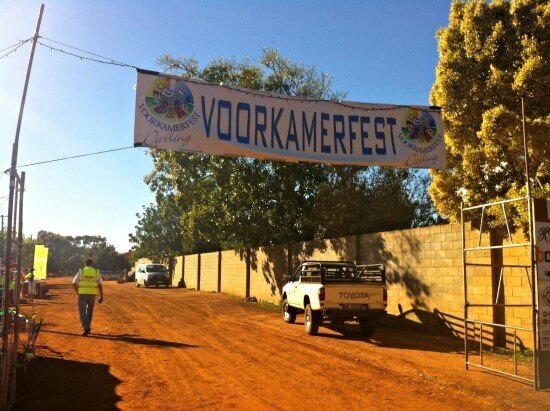 What Happens at the Voorkamer Festival?